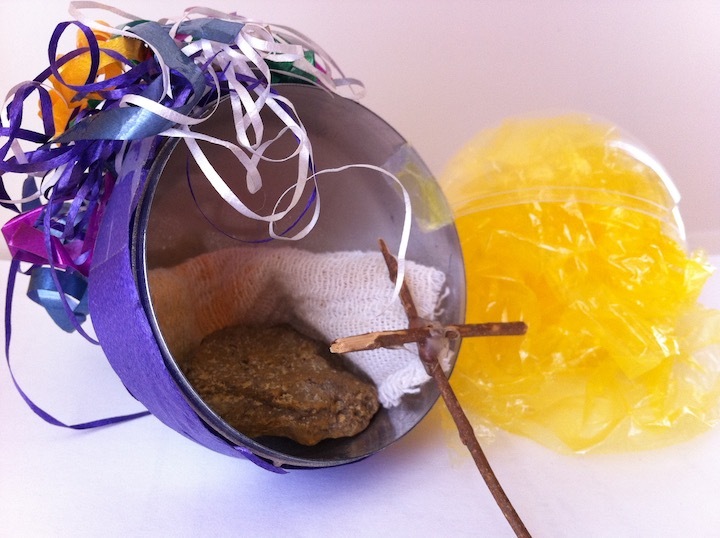 As our kids were growing up, we created a "Gospel Egg" - a single resurrection egg or "Promise Egg" to share the gospel story and true meaning of Easter rather than a regular "golden" or surprise egg. This was before the days we were able to purchase or knew about making resurrection eggs, which I am so thankful are popular today! This is just another way to incorporate the wonderful Easter story message of the Gospel into our celebrations! Small ones can be made as a great church take-home Easter craft for kids to share with their own families & friends! 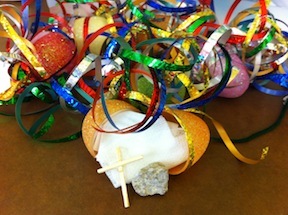 When the Gospel Egg was closed, all that could be seen was the golden cellophane and rainbow ribbon. It looked like an Easter celebration waiting to happen! This became one our families favorite Easter traditions. All four of our kids would be excited...and competitive to be the one that found the Gospel Egg! Whoever found the Gospel Egg got to share the Easter Story and the true meaning of Easter! 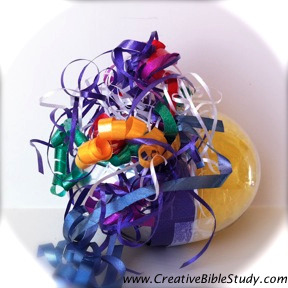 As they held the Gospel egg for all to see, they first would point to the colorful ribbons on the outside and tell of how this egg was special; it held a promise! The colorful ribbons reminded them of God's promises and how He keeps them just like the promise of a rainbow God gave to Noah. This promise was a promise of life though! They would remove the golden cellophane and explain that because of this promise, the Gospel, we can have eternal life in Heaven with God and walk the streets of gold with Him forever! They would take out the little cross and share how Jesus is the Son of God and came to earth to live as a man, but ultimately to die on the cross and pay the price for our sin. Next they would hold the gauze and tell of how after Jesus' death, He was taken down from the cross, wrapped in a cloth and laid in a tomb. Holding the now empty egg, they would shout, "And the tomb was empty, Jesus arose, He is alive!" Finally we would all quote John 3:16 together - “For God so loved the world, that He gave His only begotten Son, that whoever believes in Him shall not perish, but have eternal life." We made sure they new God's promise of salvation wasn't automatic. We continued reading John 3:17-18 and pointed out the promise of salvation & eternal life is based on us believing not only in our head that Jesus died, was buried, and rose again, but that we trust Him & believe with our hearts receiving Jesus into our lives and surrendering our life to His Lordship. Now usually when someone finds a golden egg, there is a special surprise included. To represent what a wonderful gift God's salvation is, we would include an extra special something for the Gospel Egg finder too! One neat idea is to include a surprise that the finder can share with everyone else just like we should share the good news of Jesus Christ with others! John 3:16 - "For God so loved the world, that He gave His only begotten Son, that whoever believes in Him shall not perish, but have eternal life." Romans 5:17 - "For if, by the trespass of the one man, death reigned through that one man, how much more will those who receive God's abundant provision of grace and of the gift of righteousness reign in life through the one man, Jesus Christ!" John 17:18-19 “Carrying his own cross, he went out to the place of the Skull (which in Aramaic is called Golgotha). Here they crucified him, and with him two others--one on each side and Jesus in the middle." Our Sin - Romans 3:23 - "For all have sinned and fall short of the glory of God." His Payment - Romans 5:8 - "But God demonstrates his own love for us in this: While we were still sinners, Christ died for us." 1 Corinthians 15:3-4 "For I delivered to you as of first importance what I also received, that Christ died for our sins according to the Scriptures, and that He was buried, and that He was raised on the third day according to the Scriptures,"
Romans 10:9-10 "that if you confess with your mouth Jesus as Lord, and believe in your heart that God raised Him from the dead, you will be saved; for with the heart a person believes, resulting in righteousness, and with the mouth he confesses, resulting in salvation." 1 John 5:12 "Whoever has the Son has life; whoever does not have the Son of God does not have life." These are fun to make with your Sunday school class or Awana kids too; even preschoolers will enjoy this Easter activity! This way each child can take one home and share the Gospel story with their friends and family! Make sure to print out the Scriptures - John 3:16-18 to fold up and place in each egg! 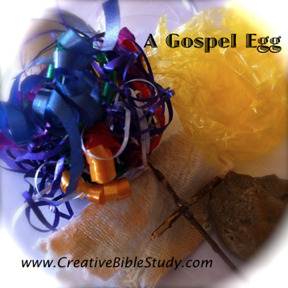 Even now that our kids are all in their twenties, we still have our same golden "Gospel Egg". 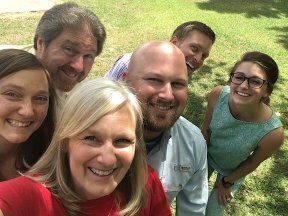 Sometimes they still like to have an Easter Egg hunt and bring it out, but whether we do or not, the resurrection story still remains the center of our Easter celebration...as well as each day of our lives! 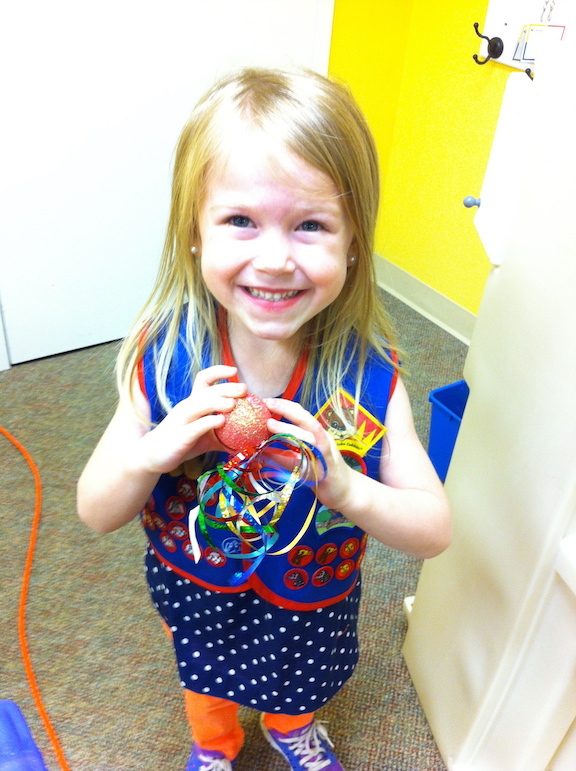 For another Easter Bible lesson for preschoolers, take a look at these E.A.S.T.E.R. eggs!